152 pages | 88 B/W Illus. Help your students develop logical reasoning and critical thinking skills. 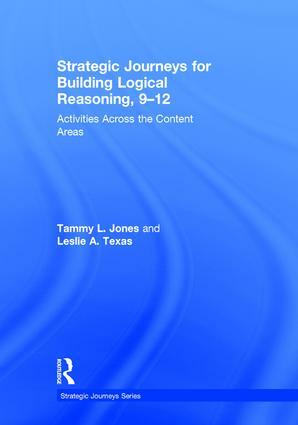 This new book from bestselling authors and popular consultants Tammy Jones and Leslie Texas offers authentic logic-building activities and writing strategies that can be used across all subject areas in grades 9-12. Filled with hands-on activities and photocopiable tools, Strategic Journeys will help you guide your students into deeper thinking to go beyond the surface of content to true understanding. Using the Three Phases of Logical Reasoning to plan lessons effectively, help students reflect on their progress, and implement the strategies successfully. The strategies in this book have been implemented in hundreds of classrooms around the country, and have been proven to increase student engagement, promote higher-order thinking and in-depth reasoning, and improve overall achievement. Section 1: Why This Journey? Tammy L. Jones has been an educator since 1979, working with students from first grade through college. She currently consults with individual school districts to support teachers in making content accessible to all students. Leslie A. Texas has over twenty years of experience working with K–12 teachers and schools across the country to enhance rigorous and relevant instruction.